The battle to save May Dreams Gardens from the moles has begun . After reading through the comments left on my previous post and doing some of my own online research, I've decided that the surest way to victory is to trap the moles. Then Jodi from Bloomingwriter sent me some additional information on email, which confirmed my decision. I guess I should say trap and kill the moles as the traps available are designed to swiftly finish off the mole. The one I purchased uses a scissor action to kill the mole, should the unfortunate mole pass through the tunnel over which I have placed this device. It won't be pretty, but it is really the best way. - Moles can tunnel up to 100 feet in a day. - There are generally only 2 to 3 moles per acre. This makes me think that there is just one mole running around my lawn and flower beds. - Moles mainly eat earthworms, and occasionally some grubs, so having moles doesn't mean you also have a bunch of grubs. And they don't eat bulbs or roots. I do have two concerns about trapping. First, I don't have a very good record when it comes to trapping animals. Remember earlier this summer, I actually trapped a rabbit with a live trap, but then it got away from me. My other concern is that once the trap is sprung by the mole, when I pull it out, according to the directions, I'll know that I killed a mole. I hope that doesn't mean that I'll pull out a mole carcass or half a mole carcass. If I do, I promise, no pictures, unless someone insists. I did read all the comments on the previous post and I am very appreciative of the advice, suggestions and encouragement. Several suggested poisoning the mole. I decided that if I am going to kill it, it should be a quick kill and not a slow, potentially painful death. And several suggested deterrents, including daffodils, scents, and sound. If I lived out in the country, I think I'd try the deterrents just to run the moles off or keep them farther away. 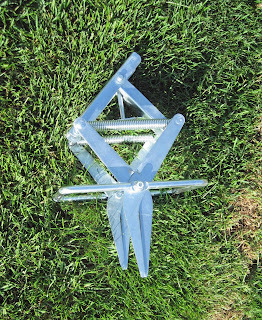 But here in suburbia, deterring moles from my lawn just forces them over to one neighbor or another, which isn't the neighborly thing to do and doesn't really solve the problem. So now the trap is set and I'm waiting for the mole to come along and then "snap", the battle ends and the garden is saved. I'll let you know tomorrow if I trap a mole. Carol, I'm catching up with your epic battles this morning and laughing all the way. "The Rabbit that Got Away" really made me hoot. Sorry, the way you tell a story is so entertaining. I really do understand your frustration with the bunnies and moles. In your previous post I suggested borrowing a skilled terrier. There is actually a fellow in these parts that you can hire to get rid of your moles. He guarantees to get rid of them. He uses traps. Your trap is a different type of trap than I have used so this is hopefully a good omen. Best of luck. Good luck in your mole eradication. Carol, if it works, could you give us some more info on the trap? Price, where you got it, brand, is bait necessary? I would be interesting in give it a try in my garden if it works for you. Good luck! I''m curious to see if the trap works. Just do me a favor, if it does work, don't take a picture. 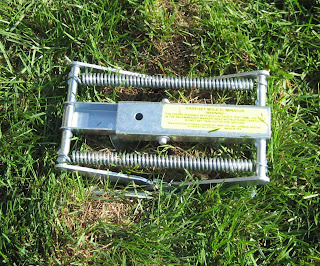 When a rat trap or gopher trap is sprung here at our house, I make my husband check it and dispose of said rodent while I run in the opposite direction. Carol - I don't know what other people suggested - can't find the post - but you can get a sort of stick that you put in the ground which emits a low thumping sound and vibration or ultrasound or something which the moles hate. and they move away. Do you really have to kill them? PS Thanks for your suggestion for the carnival. It's fine unless you particularly want to change your mind. Some people have sent in more than one anyway. Well, I'm glad I have enough room that I don't have to kill the moles. Not sure I could deal with traps and such. I sometimes worry that I'm being too mean by letting my 10 lb dog run the deer off. No photos, please. Or at least warn us! Carol, 20 posts since I've been gone? How am I supposed to catch up on that? But I will! Meanwhile, good luck with the mole trap; it sounds disgusting but necessary. Can't you get an undergardener to check the trap? I will keep your secret - just never, never tell DH and the 3 S's that you killed the mole - just tell them he went to a much better home (which won't be a lie -he'll go to mole heaven -right?). BTW...it's been less than a week and the African Violet is gasping -- drooping and gasping - you better come rescue it. 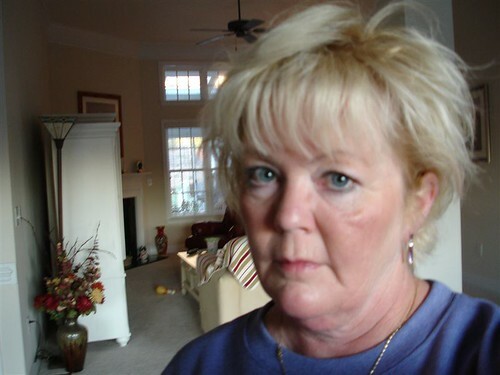 Carol- hopefully you will catch that mole and get your garden and lawn back. carol - this made me have flashbacks of a blog where the girl found a mole in her pool and posted a picture of it. im scared to check your blog now! please, no pictures or I'll show my baby rabbit guts! All... I promise I will not post a picture of the mole if I kill one in my trap. I'll just post its obituary. Well, good luck, Carol. Personally, I prefer the daffodil method and it has certainly worked well here.